The XXL enclosure I built for my son is 54" w x 48" d x 24 3/4"h, If I were to build it again, I would add another inch to the width. His SO3 enclosure is 38"w x 33"dx24 3/4" h, this allows for an extended sacrificial bed to carve full 16" x 16", I would add 2" to the width of this if I were to build it again. His XXL is sitting on a wooden workbench built for the SO3, 36" to top, the SO3 is sitting on a Kreg mobile bench 39" to top. We are both over 6’ tall, I prefer the SO3 height of the added 3". The Kreg bench will allow you to adjust the height. His enclosures are built with a hinged top/front door of 24 3/4" tall/deep with gas springs so we have better access without hitting our heads on the door. I would not use a sheet of 1/2 plywood by itself for the floor as IMO, there will be too much deflection from the weight of the Shapeoko and the stock. You need rigidity and flatness for the floor. As Craig said, you need several inches all the way around the Shapeoko. In your design, you also need to take into consideration if you want to use the front of the Shapeoko to cut pieces attached vertically on the front of the frame like mortise and tenon joinery. The height to the floor and position of the shapeoko in the inclosure could make this impossible. The other factor to consider is the ability to do tiling. There needs to be room to move the work piece past the front/rear of the machine without being too restricted by the enclosure. Thanks. I was just talking about dimensions. I would still frame it out below and above to make it rigid. I’m using 3/4" birch btw. I hear you on the vertical-mounting, I hadn’t thought of doing that, but who knows. Tiling is very important to me, as I’m going to be working on some 8ft pieces. I have the Pro model of the Glowforge for the same reason; it has pass-thru slots on the front and back. I was hoping to align the two machines directly across from each other to save space. Instead of moving my stock through the machine, which would require approx. 16ft of space, I was thinking I would clamp the stock down on the ends and move the machine along a track. Then, I would only need around 5 feet on each side, because 33" of the stock would be in the machine. I’m going crazy over-thinking this, but I have very limited space. My kids will be with me a lot when I’m using the machine, and their lung-health is top priority, hence the enclosure. Thanks. Keeping some space around the outside, and a bit over the top is really helpful - don’t build the box too close, or you’ll have a lot of difficulty squaring and maintaining it. I would invest the time and effort to make a stable work platform for your enclosure. It will simplify the build of the enclosure. If you are concerned about air quality, invest in a decent HEPA dust extraction system. I am a bit puzzled how and enclosure will work for 8’ long material unless you have doors on front and back. I had planned to do a video showing the features of my enclosure, but have not gotten to it yet. Your main question was height, I am happy with the 26" overall height, but could have gone lower due to the small diameter ( 2") hose- the larger diam you use, the more height is needed. Sending the hose out the back works well. And pls note , I mounted the control box OUTSIDE the enclosure. Cleaner design and work environment & easy access. Th unit sits on a frame with a Torsion box top. The enclosure is pictured here finished. I am very pleased with the result . The router noise is very minimal. The 63 dB Nilfisk vacuum is a lot louder than any noise emitted from the router when cutting. I found a low cost variable speed control for that which lowers the vacuum noise considerably. I used mass loaded vinyl on the interior of the box 1/16" thk to contain the sound, and 2 LED strips ( 30 K color) on the interior. I just had an idea. Has anyone tried a soft enclosure? Like a curtain around the machine / bench? I dont have much room for an enclosure right now, and hanging something like that from the drop ceiling would work. I am a bit puzzled how and enclosure will work for 8’ long material unless you have doors on front and back. I have a removable 12" high panel on the back of both enclosures which is removed with 4 screws when required for the material/job. Thanks. For the back, I was just going to make a 33" wide slot with a removable cover. For the front, the removable part would be in the “lid”. Sort of like the Glowforge pass-through slot. Hi, is that 54" on the inside of the enclosure that you would add another inch to? 54” is the outside dimension, 52 1/2” is the inside width. I have 1 1/2” square framing inside which generally does not interfere with anything. Thank You. Can I ask what you found you needed more room for? Does anybody think that it’s an issue if you can’t access the sides of the XXL, only from the front? Seems like too far to lean into to do anything I’m thinking. It seems the “full lid” enclosure variety is the preferred method. Well for maintenance you need to access the sides of the gantry, there are screws, pulleys and the controller you would want to access, it would be difficult or impossible to do this from the front without enough clearance and moving the Shapeoko may affect the tramming. 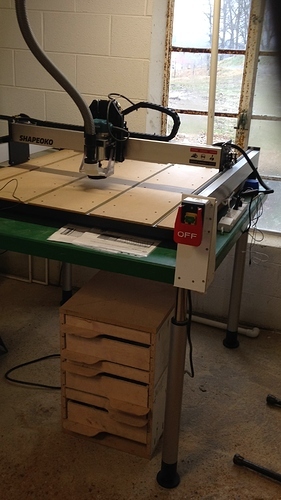 I would guess that the best way to try is to put your Shapeoko on a base the same size as your proposed enclosure, put a plank on the side to act as a wall and see if there are issues accessing the screws on the side from the front. Can you connect something to the controller? I guess this is a reason why some owners have moved their control box outside their enclosure. My machine is still in the box, never assembled. I’m just trying to get at least a platform together so I can start assembling. I hear what you’re saying, so I’m going to do something similar to what others have done with the 1/2 lid. The space on the side of the machine is helpful for maintenance, hoses, cabling, etc and cleanup. It may also allow for future modifications of your machine. For my XXL, I made a 48"x48" table. Wanted to reach the bed from both sides and front. This size left me a small side space for power strip that is connected to the Kill switch on the front corner. The small cabinet below is being repurposed for all my tools/materials needs for the router. Wheels will be added. Soon, under the table will be housing for the computer while the monitor will be on a surplus monitor swing arm. Keyboard (wireless) can sit on the front ledge. However, I’ve added a mini wireless handheld keyboard. As for height, I needed adjustability. These legs are from a commercial laboratory table and are for ADA compliance. They can adjust the table from chair (wheelchair) height, up to over 40" for standup use. To adjust, I only have to pull up a bit and then lower down. All hydraulic. Capacity of them is over 500#. The current location in our old milking barn has a very sloped floor allowing for all the washdown required when milking. Until we relevel the floor, these legs let me get the table level. So the back of your enclosure is 5’ 3/4" (or so) tall, not including the wheels? I was thinking the curtain in addition to a dust boot. Mostly for stopping noise. Maybe I’ll give it a go with something heavier, like a welding curtain, I have a couple of those I can clip up and see if the noise drops a bit.